Very often these posts will center around something perhaps more interesting than a hot dog. I’ll find a theme or some sort of joke to center the post around. 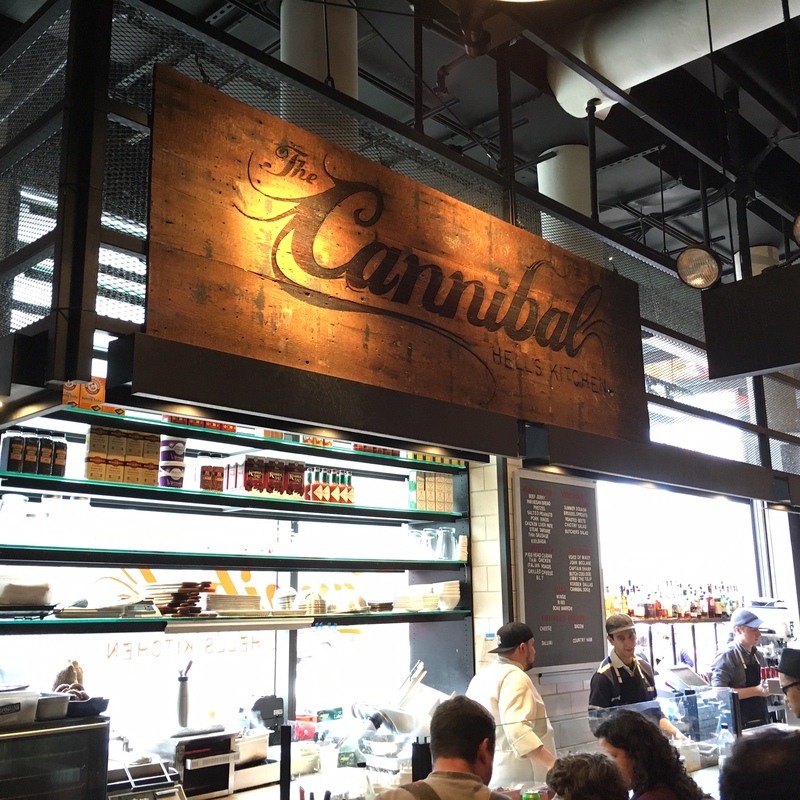 At The Cannibal in the Gotham West Market in Hell’s Kitchen, there is no need for a theme or a joke. Let’s do an experiment. I am going to suggest an action. After performing the suggested action, describe your emotions, privately. It’s therapeutic. Here’s your action: scroll up a bit on the page, look at that picture again, then scroll back to me. What?! How insane is that?! My mouth is watering, my stomach grumbling, and my pupils are dilated into the shape of hearts. Like that emoji guys try to use to be romantic. That picture is just downright pretty. This post needs only words of praise, centered only around the hot dogs. Jokes? Where we’re going, we don’t need jokes. This place has a fleet of hot dogs all with epic names. I felt like they were all part of an Italian mob. The guy in the middle? Oh, that’s Jimmy the Tulip. He’s the tough guy of the bunch. Super meaty because he’s dressed in pork rinds. But, he’s the negotiator of the crew because he’s also covered in Kale and a special sauce. He’s a total flip-flopper, and would be a great politician. The guy on the right? That’s Captain Sharp. He’s got style. Always polished and matching in the highest fashion, he’s got 3 different kinds of mustard on top with coleslaw. What a pretty boy. Then there’s that lanky guy on the left – the Cannibal Dog, we call him. This dude is nuts. When he dresses up like this, they call it “Tiger Style”, with spicy chili, Chinese mustard, and scallions (aka elegant onions). He can snap at any minute, and he does for however many bites it takes you to eat him. Lovable and loyal, he’s also wild and unpredictable. He’s my personal favorite. OK, so I did a little bit of a theme thing. Whatever, it was fun. Read it with a Tony Montana accent, you’ll thank me. The Cannibal Dog! I can’t put into words how good this was. The chili was really spicy, but didn’t kill you. The Chinese mustard was also potent, but went along so perfectly with the chili and the elegant onions (aka scallions) it laid on top of so gingerly. The toppings were great, yes, but I think what really set this wiener apart from other, similarly trendy wieners, was the frank itself. (To be frank.) I’ve written before about the snap. This one had the perfect snap. The best snap I’ve ever been lucky to be a part of. Please understand how important this is: it had the snap. Then, just to put pile more epic passengers on the already epic train, our waiter kind of looked like Tom Morrello. I also had a raspberry ale that was delicious. It was open to the street, so we got some outside air. They even had the Jets game on a projector inside. Gotham Market is cool. The Cannibal is cooler. 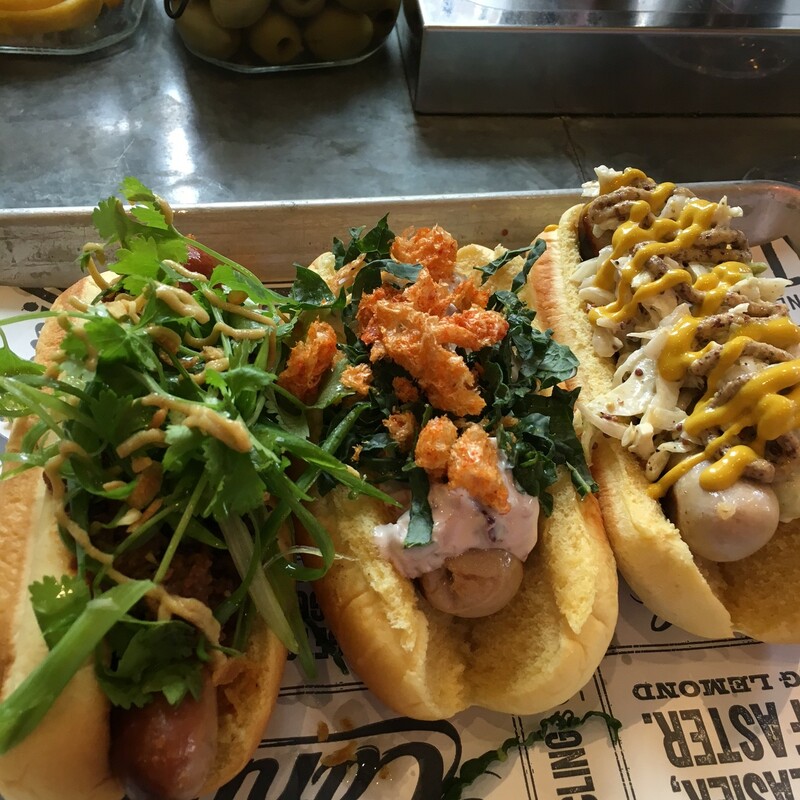 Trendy hot dogs, Yellow Mustard, chili, and the snap heard ’round the world. Come to the Cannibal as soon as you can. 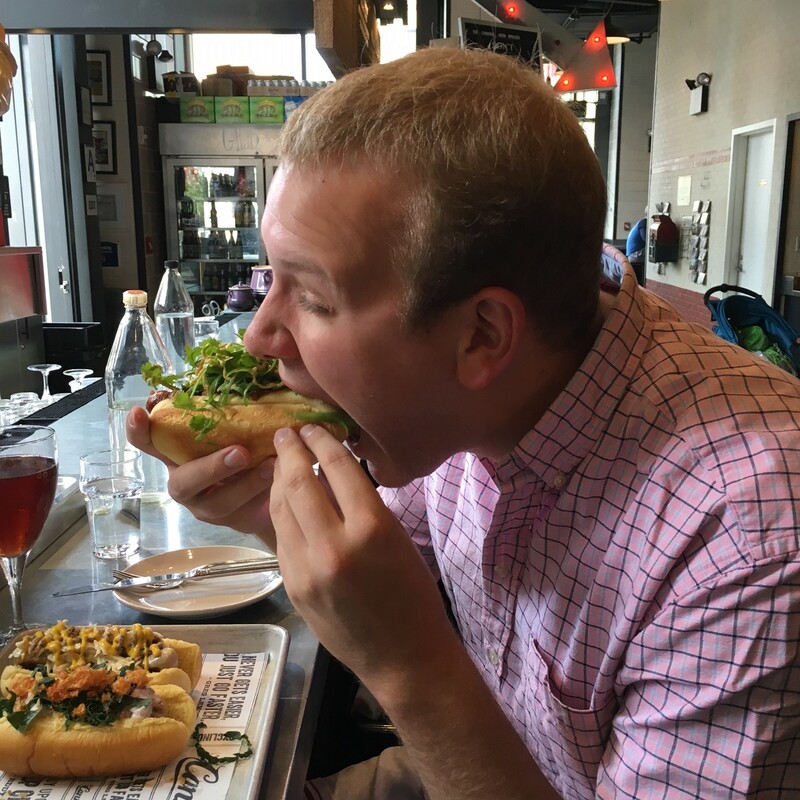 For the record, the Cannibal Dog is currently the best hot dog in New York City.